In the past series, we explained how to take a regular web application and turn it into a native-like application. Since have all of our lists defined (speakers and sessions) from our past posts (1, 2, 3, 4, and 5), we can get the simple stuff out of the way. 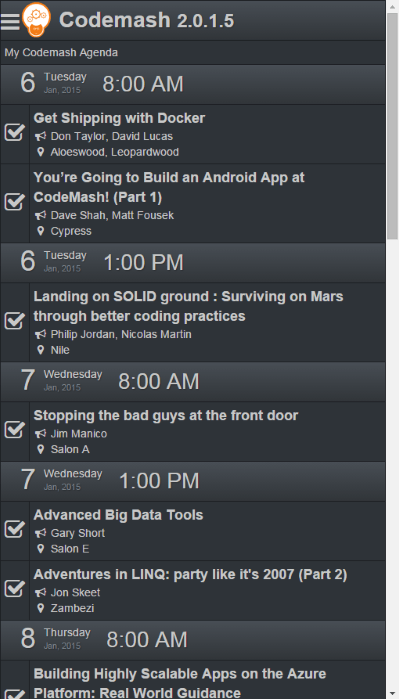 .Where(e => e.SessionType != "CodeMash Schedule Item"
and finally, created our Codemash Agenda method in our controller. So once we have everything in place, we can focus on our design of building our agenda. Our application wouldn't be much if we couldn't pick out our sessions we wanted to attend. 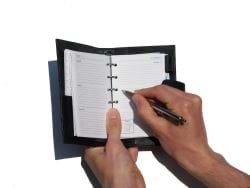 We need a way to pick our sessions (ad-hoc/at-will) and add them to our agenda. The user should be able to do that on any session detail page. After reading the description, they can choose whether they want to attend it or not by pushing the favorite button. So let's start looking at the _partialSession.cshtml partial code. Everything is pretty much the same except for the changes (which is indicated with bold). We added a button called Favorite and added an icon with a heart next to it. When immediately viewing the session detail, they will see a favorite button with no heart. When they choose it make it their favorite, they see a heart appear. But how do we save our choice to our agenda? If you want to see code regarding pouchdb, I would recommend their API section on their site. Once we create our database, it won't matter what page you're on, you will still have access to your data. For starters, we need to create our database. At the top of our codemash.js, we define our pouchDb database. I know what you're thinking. "Every time we visit this site, it will erase my database." No...no it won't. It will check to see if you have that database available. If it's not there, it will create a new one. If it already exists, we just start using it. One other note: PouchDb is a little different because it's an asynchronous database. When you check to see if there is a "document" available, it could return an error or a document. At this point, we are ready to start using our "database." Here is what we have so far for our click event on our button. // Add a new doc. In the button click, we immediately stop the default behavior of the button and make a reference to the button. The next line signifies PouchDb retrieving a "document." PouchDb uses a reserve variable called _id for all of its documents in the database. Every time you create a new document, you can assign that id. In this case, it's extremely easy because we have session ids from our web service. So the variable "id" in the get method is pulled from the HTML when we rendered each session giving us the session number (look above in the _partialSession.cshtml with the data-id attribute). After we request the document through our db.get(), we define the callback and act on the results returned. However, we may have an error. If we just created the database on an initial run, we won't have any documents in the database so we need to check for a 404 meaning the document was not found. Clever, huh? If it wasn't found, we need to "put" the document into the database and we notify the user with a favorite (heart). 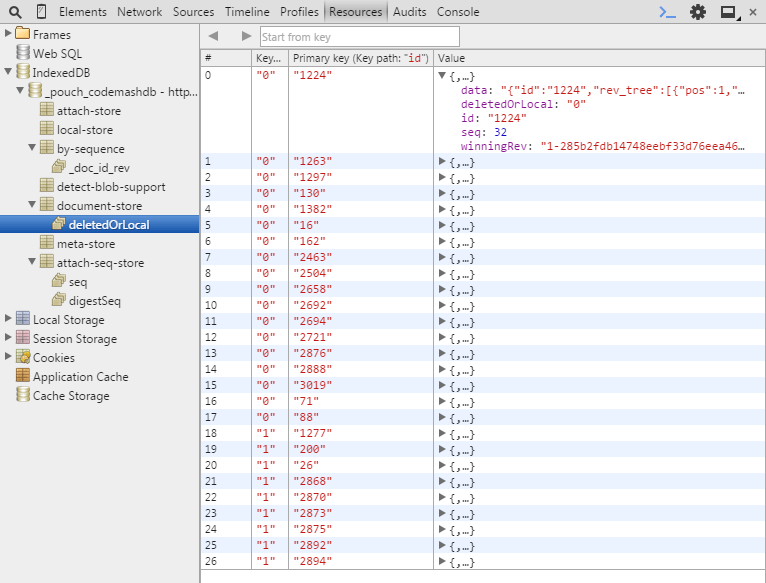 To insert a record into the table, we use db.put() with a JSON object. As mentioned above, we need an id...and we have one. So we've saved the record. If you need to view your database at anytime, Google Chrome's DevTools have an IndexedDB area under resources for you to view your records and structure. Ok, so what happens when we don't get an error? We actually get a document back. Delete the record altogether meaning that they don't like it as their favorite anymore. The downside to number one is that we could get a LOT of records in the table that aren't being used. The lesser the records, the better. So I went with number two. Remember, we need speed where possible. What happens when we hit the Back link at the top of each session detail? We want our heart to appear on our session list. Our _sessionItem.cshtml has a simple heart floating to the right to indicate a favorited session (indicated in bold below). We also get the document to make sure it's favorited or not. If it is, we show the heart. If the document isn't in the database, we turn off the heart. We forgot something. When we visit a sessions page whether it's by full session list or the session list by day, we need a way to show those favorite sessions when initially loading the page. PouchDb has a method for batch loading all of your documents called allDocs(). Since this database should be small enough, we'll load all of the documents from the database. // determine if we are on the sessions page (either all or by day). Since the session id is attached to the row number ("<tr data-id='2601'>"), we can easily find the favorite in each row and display it. PouchDb also has a property for deleted rows. What's on the Agenda now? The agenda page requires the data to be grouped and sorted by day, but everything is happening on the client-side. When we receive our data from the server, we get all of the records for the days. Immediately, we can hide the records and show only the ones from our client-side favorites. Here is what our Agenda page looks like. I know, I know...tables. This is probably the best way to represent the data with a checkbox down the left side to make immediate changes to the user's agenda. You will also notice that I do not remove the item from the list when a user unchecks the session. My thoughts on this is that we all make mistakes and tap that wrong item every once in a while. I decided to let them toggle it on and off until they decide to leave the page to accept their changes. We also need some CSS styles to make it look good. Most of this is standard "If this dom element has class, do something. If not, do something else" code. But the real code is at the bottom. On initial load, we get all of the documents from pouchdb and display only the selected sessions based on id. When you click on the row, it de-selects and removes the document from pouchdb, but not from the screen. Click it again and pouchdb saves the document to the database. As we come to a close, this has been one eye-opening experience for me. We took a full-fledged web application and optimized it by making it look like a native application in regards to speed and usability. We've used a little of old and new tools to optimize our application. I hope you've enjoyed this series and please let me know if you have any questions or concerns regarding the code. Could you have done something different? What would you have changed? Post your comments below.